I’m in the process of planning a long distance thru hike with consecutive averaging around 30km. From monitoring myself over the past few years on how my body reacts to big days on the trail, there are days where I easily burn around 8000+ calories. I have found on these big days that sometimes I just need an energy boost and products such as these gel’s come in handy. I recently reviewed the GU Energy Chews , Clif Shot Blocks, and the Clif Shot Energy Gel. I have found that each of these products provides me with different benefits and I will end up using each of these for different reasons. 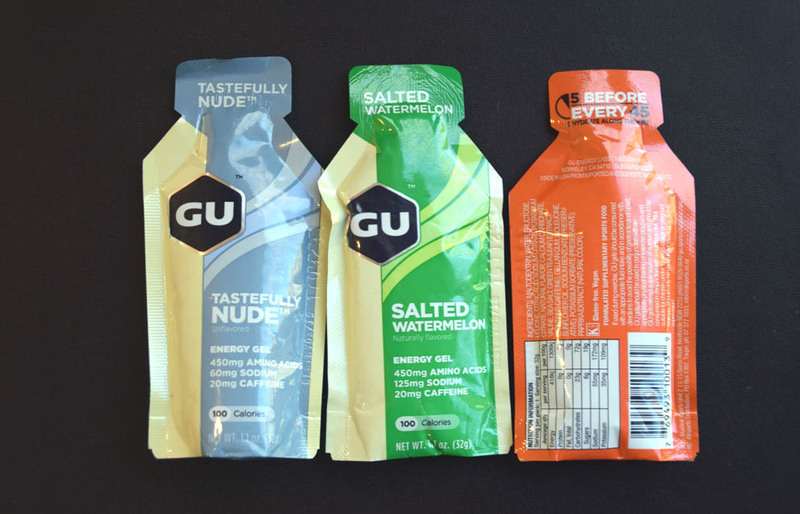 So when it came time to review the GU Energy Gel’s I was a bit unsure of how it would compare to the other products and what sort of energy boost it would give me. For those of you that have never tried energy gels before the best way to describe them is as a soft jelly like cordial. I found that in comparison to the Clif Shot Energy Gel that the GU gels weren’t as sickly sweet. This is a generalisation but accurate so if you find the Clif product too sweet for your taste then this may be a better choice. I usually get up at 4:30am each morning and have done for over 20 years, and as a result I tend to hit a wall in the afternoon at work and will usually go for something like chocolate but I tried these as an alternative. For me this tiredness is due to a combination of an early start as well as a serous gym session, or a heavy pack training session up my local mountain. Between the different flavours there were a few of them did indeed give me a kick along (see below) but others were more of a sustained burn so it’s going to depend on what you use them for as to which flavour that you pick. What I did find that by having one if these mid morning that I didn’t tend to flag in the afternoon which is usually the case. 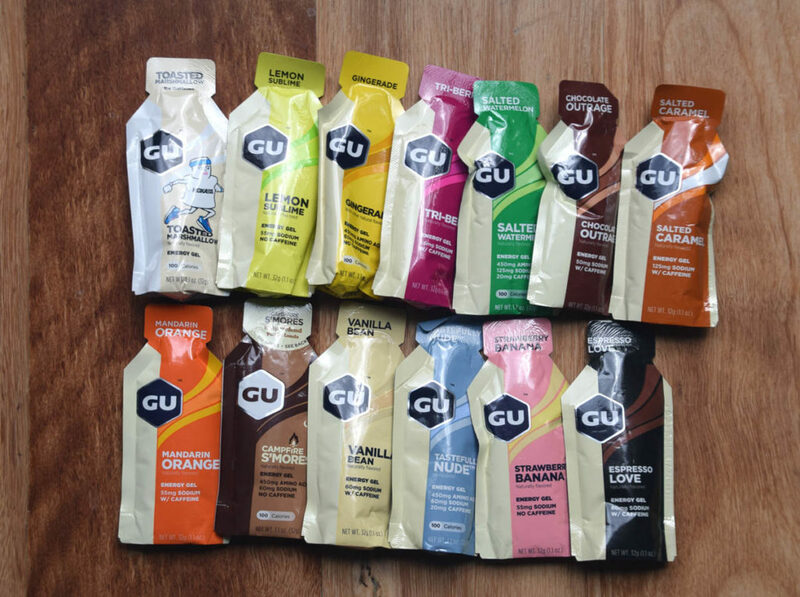 As mentioned there were no flavours in this range that I found unpalatable or over sweetened unlike some of the Clif Shot Energy Gels.The GU range is much larger so you have more flavour choices but his really is going to come down to personal taste. GU recommends that you take one of these gels around 5 minutes before activity and then every 45 minutes thereafter. While this recommendation works well if you are racing on foot or by bike where it’s a bit hard to eat a proper meal I’m not about take take 10-15 of these a day for a big day out hiking. I do however see these products being useful for is those times when you start to have a bit of a slump energy wise and just need a quick boost. In fact I have just purchased a box (Salted Caramel) to take on my upcoming thru hike to be used in conjunction with the Cliff Gels and the shot blocks as well. So how did the testing go? I find it amusing that Campfire S’Mores are ‘naturally flavoured’. I suppose that just means that whatever gives this option its taste isn’t artificial. I lived in the USA for a few years as a child and have been to summer camp but I must have missed the lesson on where to find S’Mores in nature. Having said that the taste does have that chocolate, marshmallow flavouring that you would expect. This was the first of the Gu Gels that I tried and when compared to the Clif Gels I didn’t find it as sweet but I also didn’t notice any great ‘kick’ after consuming this either. Definitely chocolate in taste and dry similar to the chocolate sundaes you by at the take away stores but not as sweet. I also didn’t notice any great energy ‘kick’ after consuming this variety. Definitely a taste of coffee but not overpowering. I didn’t notice any impact on my energy levels with this one. It took me a while to work out what this flavour was and then the penny dropped; Ginger with a bit of lemon. I found that this one did indeed provide a bit of energy boost. A combination lemon lime flavour but I didn’t notice any impact on my energy levels with this one. A sweet mandarin flavour and this one, presumably due to the caffeine, had a noticeable energy burst for me. Definitely a Caramel taste and reasonably pleasant given I don’t normal like caramel. This one, presumably due to the caffeine, had a noticeable energy burst for me. I’m usually not a fan of either strawberry or banana products that aren’t made from fresh fruit. I found that these two tastes balanced each other and provided a good taste combination. No real kick for me as far as an energy boost though. This option is advertised as unflavoured but for me there is no such thing and as such I tasted a slight caramel flavour. This one did give me a bit of a kick along energy wise. Tastes like caramel rather than marshmallow. A bit sweet but not sickly and there was a bit of an energy kick from this one. There was definitely a berry flavour to this one but it wasn’t that sickly sweet flavour. After very long hard day I found that this variety gave me a good energy boost. While I could taste Vanilla on this one there was also a hint of caramel, almost a brûlée flavour. This one did give me a bit of a kick along. I had been advised by my nutritionist to test these out to ensure that I didn’t have any adverse digestive reactions. In consuming this product over a period of days I also didn’t find any issues which is something I wanted to confirm before committing these to a hike. Having said that this should be something you test out and see what your response would be. Listen to podcast episode 057 Nutrition on the trail for additional information on supplements and hiking. Would I use this product? Not as part of my short hikes but on those days when I’m trying to cover big distances, over long hours I will definitely include them as part of my nutritional intake.